The story behind the name: The constellations that are included in the Zodiac - the 12 constellations recognized by Babylonian astronomers through which our Sun, moon, and planets appeared to travel during the course of a year - are considered to be among the oldest sky patterns recognized by human civilizations. They were thought to have more significance because they were touched by the Sun. Images of the creature represented by Capricornus, often with the head and body of a goat and the tail of a fish (a sea-goat), have been found in 3000 B.C.E. year-old Babylonian tablets. 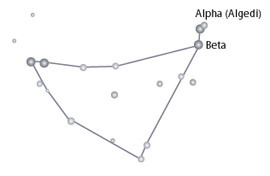 Recognition of the constellation is probably even older. In Latin, Capricornus means "horned goat", and many of the names given to its stars by Arab astronomers refer to parts of a goat, kid, or ibex, and to related sacrificial rites. The constellation is found in the part of the sky identified with water constellations, including the two water constellations of the zodiac. Possibly the association with water is linked to the seasonal rains that come during the months that these constellations rise in the sky. Some accounts explain the pattern as only a fish tail, others as the shape of the two initial letters of the word "goat" in Greek. Myths and stories linked to the constellation often try to reconcile these two different associations. One legend links this pattern to Babylonian Ea (Gr. Oannes), an ancient god with a human upper body and the tail of a fish who emerged from the sea to bring knowledge and culture to humans. Two to four thousand years B.C.E, the Sun would have reached winter solstice when passing through Capricorn. In the ancient civilizations of that time, the winter solstice was recognized as the "bottom" of the Sun's yearly path. From there it rose again, higher and for longer periods in the northern sky as the seasons progressed toward summer. Thus this constellation (or possibly an earlier version) may have been associated from very ancient times with legends and rituals of annual sacrifice, renewal, and nourishment. In Greek mythology, the constellation was variously associated with the gate through which the souls of the dead passed, with a legendary goat said to have nursed the infant Zeus (and by metaphorical extension, the Sun), and with a myth in which the god Pan (lower half goat, human torso and head with goat horns) tried to escape the monster Typhon by turning into a fish; he managed to morph only his lower half.